Fat Bruce Lee (on a diet) and I were on our way to sample a Ruth's Chris burger, but the allure of the South Beverly Grill was simply too much for us to resist, so we stopped short of our destination. Upon reaching the front door, we did discover that South Beverly Grill was a Hillstone Restaurant Group joint--Gulf Stream, R+D Kitchen, and Houston's--none of these burgers had been stellar, and some had been downright lousy. But...we eat hard so you don't have to, so we pressed on. There was no wait for bar seating, so bar it was. This was one of the few bars that I have been to that served those tiny bottles of Diet Coke rather than having a fountain or a gun to fill the glasses. The cheeseburgers were $14 each and came with the usual toppings and fries. It is worth noting that "diet" does mean what Fat Bruce Lee thinks that it means. The Beef: 80:20 Chuck...they were proud enough of the Chuck to state on the menu that they used, "Ground Chuck Steak, all the way." 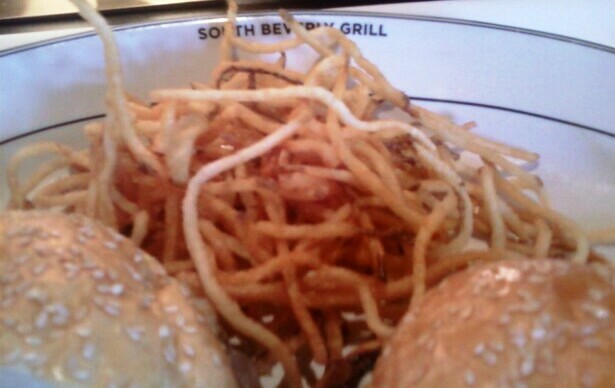 Interestingly and happily, unlike at the sister restaurants, the beef at the South Beverly Grill was pretty good--it was strongly beefy in flavor. It was lacking in iron and aging, but it was flavorful and pleasant. It was also very juicy. The Sear: They cooked it on a gas grill and got some thorough grill marks on the patty. This gave it a satisfying medium sear and no char. This was good, too. The Seasoning: This was a little overdone. The individual that was grilling the burgers had a heavy hand with the spice shaker. As a result, the burgers were over-salted--not dramatically, but they used more seasoning than was appropriate. 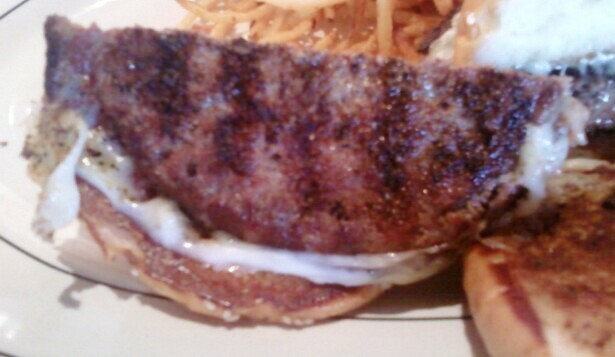 The salt did dominate/mask the more subtle flavors of the burger. 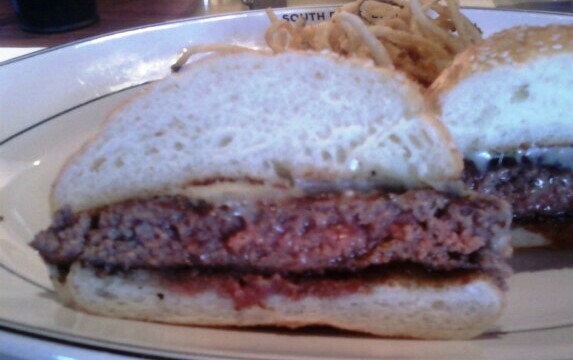 There was enough blood in the burger that it should have tasted of iron, but the salt killed that flavor. The Preparation: They nailed the requested Medium over a hot gas grill. The 9 ounce patties were formed gently with a house ground Chuck--the grind was medium coarse. This made the burgers firm but not chewy--it also left long enough strands of beef so that the mouth feel was substantial and satisfying. The Cheese: Meh--the cheese was a passenger--the mild, white Cheddar added nothing to the dish--perhaps this was because of the amount of salt shaken onto the patty. The Bun: They baked the chewy, sweet, seeded, moist, yeasty burger buns in house. The bun was fresh and toothsome. It was springy yet yielding--this was a truly excellent bun. The other Hillstone establishments' kitchen staffs should spend a week at South Beverly Grill to learn how it's done. This goes for not only the baking of the buns but also the grinding and grilling of the meat. The Meat to Bun Ratio: It was PERFECT...down to the last morsel. The Fries: These were super skinny, crisp fries, which needed more salt, but they were fine. Skinny fries like this, due to the high surface area to volume ratio, loose their heat rapidly. This results in room temperature fries--not a fan. The Value: It was difficult to gauge--Fat Bruce Lee and I were in shock that a Hillstone restaurant put out a good burger. $14 was a little steep for Chuck, but this was a burger that we would eat again--the value was fine. R+D Kitchen, Houstons, and Gulf Stream all started with the same ingredients, but none of them were able to produce a cheeseburger as good as the one that we had at South Beverly Grill. Burger Review : This was a better than average burger, and the portion was large. We both finished our burgers in spite of the over-seasoning.